An Oregon man has launched a civil rights lawsuit after he got hit with a $500 fine for promoting his research about traffic lights without a state engineering license. An Oregon man has launched a civil rights lawsuit after he got slapped with a $500 fine for speaking about his research on traffic lights. After his wife got a ticket from an automated traffic camera in Beaverton, Ore., Mats Jarlstrom decided to investigate how traffic lights are timed. 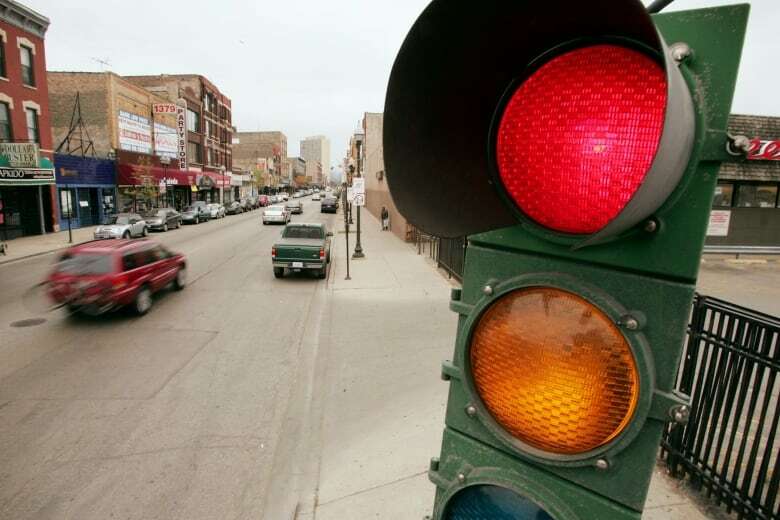 Jarlstrom — who has a bachelor's degree in electronics engineering in Sweden, where he was born — concluded that yellow lights should last longer to give people enough time to make right turns. He came to that conclusion after reaching out to the people who wrote the original 1959 formula used to time traffic lights and learned it only accounts for people driving straight through an intersection. But when he started to discuss his new, modified traffic formula with public officials and the media, the Oregon State Board of Examiners for Engineering and Land Surveying launched a two-year investigation into his activities and fined him $500 US for practising engineering without a state licence. "I was shocked. I felt violated, not only for being fined for that, but also for stating who I am," Jarlstrom told As It Happens host Carol Off. He said he was punished for "talking freely about language, universal language, which is mathematics and physics." The board declined to comment on the case, citing ongoing litigation. In its notice of civil penalty, the board cites numerous emails Jarlstrom wrote to the board, the local government and the media in which he described himself as an engineer. Jarlstrom stands by that assertion. He studied engineering in school and worked as an electronics engineer in Sweden, where the profession does not require licensing and registration. He is not licensed to practice engineering in Oregon, where he works as as a self-employed consultant testing audio products. "In Sweden, I am definitely an electronics engineer. I have been working as such for over 30 years. So I am not misrepresenting myself at all," Jalstrom said. In Canada it is similarly illegal to practise engineering or call yourself an engineer without a provincial or territorial licence. With the help of the libertarian Institute for Justice, Jalstrom fired back with a lawsuit alleging his First Amendment right to free speech had been violated. "The government does not have the power to take speech that is objectively true, declare it false, and then punish speakers who—wittingly or unwittingly— deviate from the government's idiosyncratic definition," the lawsuit reads. Jalstrom's case is one of many ongoing battles in the U.S. between individuals and licensing boards clamping down on people working outside the system. According to the New York Times, 30 per cent of the U.S. work force needs a license to work, up from about 10 per cent in the 1970. As It Happens earlier this year profiled a Tennessee woman who faced jail time for massaging horses without a veterinary licence — something she called "an extreme case of government overreaching." For Jalstrom — who wants to have his work peer-reviewed and published — it's a matter of free speech. "They are actually hampering my right to speak today. I can get fined, I can even get jail time here in Beaverton, for addressing these issues," he said.